Alok Sharma passed his PMP exam on April 12, 2010 with good grades. 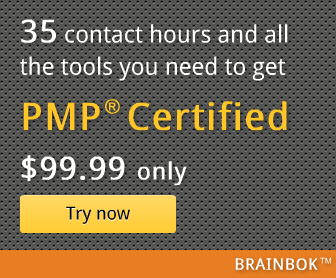 He has compiled a very useful list of study notes for PMP certification, and has been kind enough to share it with us. I hope you find it useful. a. is when you are looking at way the process affects the quality. 22. Portfolios are organized around business goals. 23. Take stern action against discrimination. Note: I have made an attempt to be as accurate as possible. However, if there are mistakes, please rectify the same. I have cleared the PMP exams on 12th April with Proficient in 4 and Moderately Proficient in 2 areas. 2. During the end of the preparation, while going through Glossary, I used to try and describe the word instead of reading it. I noticed that I was able to describe most of them and also the time taken was considerably less, which added to my confidence. Regarding point 67 i have a doubt. But as per my understanding WBS is describes the deliverables w.r.t to project and product and not the actual work. You can refer to - Product Scope, Project Scope and Requirements - for related info. ), i have one doubt where i'm trying to get the answer from many sources, but i couldn't. Could you please clarify me the same, with an example. Appreciate your efforts for clarifying the doubts with example which is understood to anybody. Normally you'll find some clues in the question that should help you determine whether to include the PM in the 'n'. 1. You are a project manager and you have a team of 5 people. 2 more members are added to your team. How many new communication channels are added? In this case, I'll assume that PM is not included in the 5 members. So, n would be 6 initially and then increased to 8. 2. A team has 6 members. Two more members are added. How many more communication channels are added? In this case, it's simple. n is 6 initially (PM included) and 8 later.